TR4A & TR250. SHOCK ABSORBERS. or take more pictures. before purchasing. rather than afterwards. (hole centres = 102mm. are suitable for their cars. ). Triumph gt6 spitfire herald and vitesse horn centers all used. Engines, Gearboxes and Differentials. Servicing, MOT's, Repairs and Restorations. Race and Rally preparation. 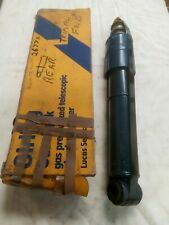 1 X GIRLING 2677A GAS SHOCK, TRIUMPH FWD REAR WRITEN ON BOX, CHECK PICTURES AGAINST YOURS. 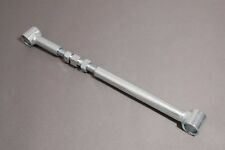 Fits: Triumph Herald All Models Front Suspension. NEW Pair of Front shocks. New lower bushes already fitted. UK mainland only, if you live outside the. PRIOR TO PURCHASING. sold as pairs. TRIUMPH TR7 ; YEARS 1975-1981. The price is for a set of 4 which will typically complete 1 standard car (2 bushes per shock absorber). Triumph gt6/ vitesse lightweight billet flywheel. we have had we have these made for us our own design of lightweight flywheel in billet steel. the actual flywheel weighs in at 3,3kg so you can see how much weight is saved without the loss of drivabilty. TRIUMPH VITESSE 6/1600 & 2 LITRE ; YEARS 1962-1971. TRIUMPH GT6 MkI, II & III ; YEARS 1966-1973. 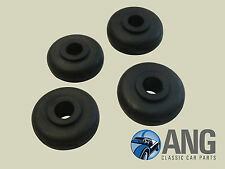 They are manufactured from standard black rubber. KYB is the worlds largest manufacturers of OE shock absorbers, with 1 in 4 vehicles leaving production lines with KYB as standard. TRIUMPH 2.5 PI MK I 2.5 Saloon Petrol 01/1968 12/1975 RWD 12 134 99. TRIUMPH 2.5 PI MK I 2.5 Saloon Petrol 01/1968 12/1975 RWD 12 134 99. TRIUMPH 2.5 PI MK I 2.5 Saloon Petrol 10/1968 10/1975 RWD 12 122 90. TRIUMPH 2.5 PI MK I Estate 2.5 Estate Petrol 01/1968 12/1975 RWD 12 134 99. Koni Classic dampers use highly evolved damper technology to give you superior driving comfort and better handling. Koni Part Number: 80-1389. Triumph Spitfire Mk2. Price is for one shock absorber only. Koni Classic dampers use highly evolved damper technology to give you superior driving comfort and better handling. Triumph GT6 Mk3. Koni Part Number: 80-1389. Price is for one shock absorber only. Years of manufacture: 74 > 74. Koni Classic dampers use highly evolved damper technology to give you superior driving comfort and better handling. Triumph TR4A (IRS). Koni Part Number: 80-1784. With independent rear suspension (IRS). TRIUMPH TR7 ; YEARS 1975-1981. Triumph dolomite sprint engine gearbox adaptor plate in good cond. PRIOR TO PURCHASING. Koni Classic dampers use highly evolved damper technology to give you superior driving comfort and better handling. Triumph Vitesse. Koni Part Number: 80-1388. Price is for one shock absorber only. Years of manufacture: 62 > 71. Koni Classic dampers use highly evolved damper technology to give you superior driving comfort and better handling. Koni Part Number: 80-1388. Triumph Spitfire Mk1 (Spitfire 4). Price is for one shock absorber only. Koni Classic dampers use highly evolved damper technology to give you superior driving comfort and better handling. Koni Part Number: 80-1784. Triumph TR6. Price is for one shock absorber only. Years of manufacture: 69 > 76. Koni Classic dampers use highly evolved damper technology to give you superior driving comfort and better handling. Koni Part Number: 80-1389. Triumph Herald, incl. Convertible & Estate. Price is for one shock absorber only. Koni Classic dampers use highly evolved damper technology to give you superior driving comfort and better handling. Koni Part Number: 80-1389. Triumph Spitfire Mk1 (Spitfire 4). Price is for one shock absorber only. Koni Classic dampers use highly evolved damper technology to give you superior driving comfort and better handling. Koni Part Number: 80-1005. Triumph TR4. Price is for one shock absorber only. Years of manufacture: 61 > 65. Neuer Stoßdämpfer VA Boge Automatic 32-301-0. Dies hat keinerlei Auswirkungen auf die Rechte zwischen dem Käufer und uns. Neuware aus altem Lagerbestand. Es handelt sich hierbei um Ware aus einem Geschäft/Werkstatt das vor vielen Jahren aufgelöst wurde. Triumph spitfire 1500 /1300 gt6 herald vitesse and dolomite sprint. Engines, Gearboxes and Differentials. Servicing, MOT's, Repairs and Restorations. Race and Rally preparation. Koni Classic dampers use highly evolved damper technology to give you superior driving comfort and better handling. Triumph TR5. Koni Part Number: 80-1784. Price is for one shock absorber only. Years of manufacture: 67 > 69. Koni Classic dampers use highly evolved damper technology to give you superior driving comfort and better handling. Triumph GT6 Mk1. Koni Part Number: 80-1389. Price is for one shock absorber only. Years of manufacture: 66 > 68. Diese Angaben finden Sie in Ihrem Fahrzeugschein unter folgenden Ziffern KONI,80-1784//74. Technologie von heute in Autos von gestern. Hochentwickelte Dämpfertechnologie für aufwendig restaurierte Klassiker mit der gleichen Qualität, wie KONI sie für moderne Fahrzeuge bietet. It also has the fuel gauge still fitted. Engines, Gearboxes and Differentials. Servicing, MOT's, Repairs and Restorations. Race and Rally preparation. Koni Classic dampers use highly evolved damper technology to give you superior driving comfort and better handling. Triumph GT6 Mk1. Koni Part Number: 80-1388. Price is for one shock absorber only. Years of manufacture: 66 > 68. Koni Classic dampers use highly evolved damper technology to give you superior driving comfort and better handling. Koni Part Number: 80-1388. Triumph Spitfire Mk3. Price is for one shock absorber only. Koni Classic dampers use highly evolved damper technology to give you superior driving comfort and better handling. Triumph TR250. Koni Part Number: 80-1784. Price is for one shock absorber only. Years of manufacture: 68 > 69. 1 Stück Koni Classic Stoßdämpfer. Stoßdämpfertechnologie von heute für Autos von gestern oder vorgestern. Farbe: Schwarz oder Rot. Besseres Handling und klassischer Look. Klassischer Look. Koni Classic dampers use highly evolved damper technology to give you superior driving comfort and better handling. Triumph GT6 Mk2. Koni Part Number: 80-1388. Price is for one shock absorber only. Years of manufacture: 69 > 70. Koni Classic dampers use highly evolved damper technology to give you superior driving comfort and better handling. Triumph GT6 Mk3. Koni Part Number: 80-1388. Price is for one shock absorber only. Years of manufacture: 74 > 74. Diese Angaben finden Sie in Ihrem Fahrzeugschein unter folgenden Ziffern KONI,80-1005//73. Technologie von heute in Autos von gestern. Hochentwickelte Dämpfertechnologie für aufwendig restaurierte Klassiker mit der gleichen Qualität, wie KONI sie für moderne Fahrzeuge bietet. 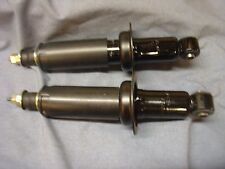 Pair shock assemblies removed from Spitfire. Good used parts, shocks not leaking or seized, springs unbroken, you will have to wirebrush and paint if you want it to look nice. Koni Classic dampers use highly evolved damper technology to give you superior driving comfort and better handling. Koni Part Number: 80-1388. Triumph Herald, incl. Convertible & Estate. Price is for one shock absorber only. 1980-1981 3.5 Petrol Convertible 135 bhp CRITERIA: Rear. Shock Absorber Mounting Type:Bottom Pin,Top pin. Shock Absorber Type:Gas Pressure. Shock Absorber System:Monotube. FOR TRIUMPH TR. Fitting Position:Rear. 1970-1977 3.0 Petrol Targa 145 bhp CRITERIA: Front. Shock Absorber Type:Gas Pressure. Shock Absorber Design:Suspension Strut Insert. Shock Absorber System:Twin-Tube. Fitting Position:Front. Koni Classic dampers use highly evolved damper technology to give you superior driving comfort and better handling. Koni Part Number: 80-1389. Triumph Spitfire Mk4. Price is for one shock absorber only. We have a very good usable pair of the headlamp cowls for the spitfire and gt6 later style bonnets. Engines, Gearboxes and Differentials. Servicing, MOT's, Repairs and Restorations. Race and Rally preparation. Numéro de pièce fabricant 333901. Triumph Acclaim 1.3 (XD). Lugar de la Asamblea: essieu arrière. If you are looking to swop your early spitfire over to the later swing spring which makes the car handle. much nicer and reduces the effect of the tuck under which the triumphs suffer with. Engines, Gearboxes and Differentials. 2 Stück Koni Classic Stoßdämpfer. Stoßdämpfertechnologie von heute für Autos von gestern oder vorgestern. Farbe: Schwarz oder Rot. Besseres Handling und klassischer Look. Klassischer Look.